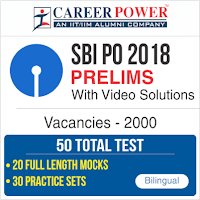 Following the study plan for SBI PO Preliminary Examination 2018, the fourth week starts with practice questions on Misclleneous Questions Set. To ensure proper preparation of the section we advise you to go through all the questions sincerely and try to attempt each one of them. Afterward, match your solutions and the approach with the one that would be provided later. Practice more and more questions on the same section to enhance your grip over the topics. Following is the Quantitative Aptitude quiz to help you practice with the best of latest pattern questions. Directions (1-5): Line-graph given below shows the number of students playing three different games in five different schools. Study the data carefully and answer the following questions. Q1. Total number of students playing Hockey from schools ‘N’, ‘O’ and ‘P’ together is what percent more than the total number of students playing Cricket from schools ‘L’, ‘M’ and ‘N’ together? Q2. Male students from all the schools together, who play hockey is 75% more than female students from all schools together who play hockey. Find the total number of male students who play hockey from all the schools together? Q3. Find the ratio between students who play football from schools ‘L’ and ‘M’ together to students who play cricket from schools ‘O’ and ‘P’ together? Q4. Average number of students playing football form all the schools together is how much more than average number of students playing cricket from all the schools together? Q5. Total number of students playing hockey in school ‘Q’ is 25% more than the total number of students playing hockey in school ‘N’ and ‘O’ together. Find the total number of students playing cricket from school ‘Q’ if ratio between students playing hockey to cricket in school ‘Q’ is 5 : 6? Q11. At the time of marriage, ratio of Bharat’s age to Pinki’s age was 6 : 5. After 1 year of marriage, a girl child was born and after 2 more years, a boy was born. At present, the average age of family is 16 years, and the age of baby girl is 5 years. Find present age of Pinki? Q12. Ratio of speed of the train ‘A’ to speed of train ‘B’ is 2 : 3. Train ‘A’ can cross a pole in 2 seconds. If length of the train ‘B’ is 200% more than that of train ‘A’. In what time, train ‘B’ can cross train ‘A’ If they move in the same direction. Q13. Average of present ages of Simmu, Jagga and Pooja is equal to the present age of Jagga. Eight years ago, ratio of Simmu’s to Jagga’s age was 5 : 4. If Simmu’s age is 4 years more than Jagga’s age. Find Pooja’s present age. Q14. Train ‘X’ takes 2 hours more than train ‘Y’ to cover certain distance ‘D’ while train ‘X’ can cover (D + 160) in 8 hours. If speed of the train ‘Y’ is 50% more than that of train ‘X’, then find the speed of train ‘Y’? Q15. Five years ago, Neeraj’s age and Bhavya’s age were in the ratio 5 : 4. 5 years hence Bhavya’s age and Abhi’s age will be in ratio 3:2. If currently, Neeraj’s age is twice Abhi’s age, then what will be the age of Bhavya 10 years from now. 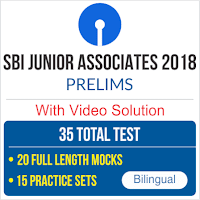 Check Detailed VIDEO SOLUTIONS of this Quiz! !